Who doesn't love a mashup? Wait, what is a mashup? When two or more things are slammed together to make one new cohesive thing. Well the goal is to make it cohesive. In the new musical Olympus Records, the 90s and Greek drama are slammed together for a musical tragicomedy of epic proportions. With music by Morgan Clarke and a book by Alex Prather, Olympus Records is a “Behind the Music”-esque musical about the tragedy that is hot band Sophocles. The members of Sophocles all happen to be characters of Greek tragedy. As the musical progresses the band breaks up and falls apart, some to the point of death, as their record label, Olympus Records, controls their every move. While the concept is intriguing, why Greek characters are brought to the 90s is the big question. Finding the justification of this question seems to be impossible in the given script. As it stands now, they appear as two arbitrary ideas the creators decided to place together. What made the 1990s a decade that was like a Greek tragedy? Despite this flaw, the 90s play a comedic role in the musical. From subliminal references to slap bracelets to musical odes to 90s music including Backstreet Boys, Alanis Morissette, and Hootie, Olympus Records is never short in remind the audience of the decade that was. The Greek characters brought into this world include Odysseus, Elektra, Antigone, Philoctetes, and Agamemnon. How these characters are the chosen few is never quite answered. Dramaturgically, the original arcs of some of these characters are explored, but to slam their presence further, a more obvious parallel was needed. There were moments that the characters appeared as if they only shared the names and not the identities. Additionally, the “rock god” the band worships is a character called Eddie Wonder. Why Prather didn’t use another Greek character to take on this role is quite confusing. As far as Morgan Clarke’s score is concerned, Clarke does a nice job using the polarizing decade of music as inspiration. You almost wonder though would Olympus Records have been a stronger musical had the story been the same but it was a jukebox musical featuring actual songs of the decade. Although there were some severe audio problems in the show, the entire cast rocked out. The scene stealing and strongest performance in the production came from Scott Johnson. Johnson is brilliant in his hilarious turn as the artist formally known as Phil. He has impeccable timing, busting out his best boy band moves. 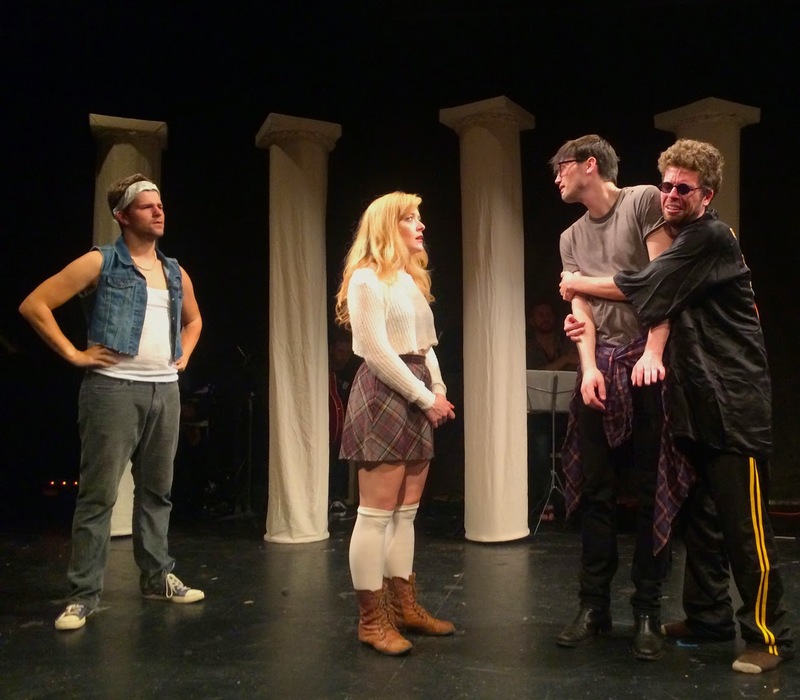 As Agamemnon, Eddie Wonder, and Johnny Nightly, Justin Perez brought the hysterical funny. Perez was the right amount of sleazy and pinch-your-cheeks loveable. Jonathan Grunert and Jacob Thompson as Odysseus and Ajax played up the rage comedy, though the former’s was a bit one dimensional leaving the character as a whiney unlikeable character. Every Greek tragedy needs a chorus and the 90s Greek Chorus were utilized to showcase their talents. Samantha Blain was funny as the quintessential fan girl and Mack Shirilla was the overall standout of the bunch with his pure vocals and perfect dance moves. Director Nikki Rothenberg did her best to salvage the script. Rothenberg played up the comedy and references to the best of her abilities. Alina Uzlov’s set was perfectly simple with a clever Greek column concept. Having Gustavo Valdes’ lights inside of the columns added a nice colorful punch to the bland space they were forced to use. Nikki Bosso evoked the 90s through her costumes though you wonder what adding an element of classic Greek theatrics would do to help the mashup idea. In a Fringe setting, production value is never going to be what it needs to be. But when the vocals are compromised by a poor sound system, it’s a disservice to the entire production. This musical thrives on the rock and roll world and needed microphones and stands, but figuring out a way to make them actually work was essential. Olympus Records is a fun concept on paper that died in its execution. With too many “whys”, Prather and Clarke may need to fine tune their piece if they hope to have a future with it.